Ahead of Chinese President Xi’s visit to the European Union in Brussels, a significant naval exercise has took place in the Gulf of Aden to demonstrate the growing cooperation between the EU and China on issues of international security and defence. 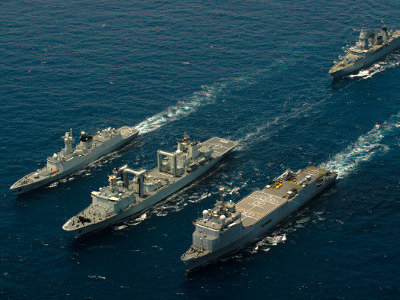 Late last month the EU Naval Force warships, FS Siroco and FGS Hessen conducted a joint counter-piracy exercise with two Chinese Navy ships, CNS Yancheng and CNS Taihu. The exercise, which took place at sea in the Gulf of Aden, had followed a day of pre-briefings on board FS Siroco, when the EU Force Commander, Rear Admiral Herve Blejean, welcomed Senior Captain Li Pengcheng and the rest of the Chinese delegation to the EU Naval Force flagship to discuss the exercise and the various events that would take place the following day. With military helicopters hovering overhead, the exercise began with the EU and Chinese warships manoeuvring close to each other to simulate a refuelling at sea operation. Members of the ships’ crews then transferred across to each other’s ships to conduct a series of practical demonstrations and exercises. The exercises included a joint counter-piracy boarding operation, with the Chinese and EU Naval Force boarding teams embarking onto the Chinese logistics ship, CNS Taihu. Small-arms and helicopter exercises were also carried out. The busy day ended just before sunset, with the ships bidding a warm farewell to each other with a traditional warship ‘sail past’.